I don't watch much television, but I always make a point of watching The Apprentice. It's pure train wreck TV; a show designed to make people look as bloody stupid as possible. I'm sure you've head of it. A bunch of hopefuls get put through the wringer in a series of implausible business scenarios designed exclusively to make them look like complete pillocks ("You have 12 hours to launch a new international superstore with 50p and a stick of chewing gum") . Cameras follow them, recording everything so it's possible to recut the footage exclusively to make them look like complete pillocks. And then at the end, Alan Sugar talks about himself a bit, says how hard he is to please, and then reads from a script of insults designed exclusively to make him look like a complete pillock while all the contestants simper, stab each other in the back, and call him "Sir" like they're a group of naughty schoolchildren. I only bring up my fascination with this show because in a recent episode (warning, spoilers ahead) one of the contestants was told he was on his "last chance." The other contestants, smelling blood in the water, suggested he should be the project manager for the next task. Now, that's a pretty crappy thing to do to someone who's already at risk of being hanged by his own business tie, because whatever he does, he's doomed. If he agrees to be project manager, and the team loses the challenge, he gets fired without hesitation as he's burned his last chance. If he doesn't agree to be project manager, and the team loses the challenge, he gets fired because he didn't step up to the plate and prove he was a true leader. It's a classic "damned if you do, and damned if you don't" scenario. And I should imagine games designers face a similar situation when they make an expansion, a new edition of a popular game, or (as is the case with Warhammer Underworlds: Nightvault) a new "season" of product releases. They can be bold, taking the game in a new direction but putting themselves in the crosshairs if something goes wrong, or they can play it safe and do more of the same, risking accusations of cowardice or laziness. The problem is, different people expect different things. There are people who loved the original, and want more of that experience. There are people who thought the original was lacking, and want something extra. And then there are people like me, who don't know what they want and ultimately have to accept the fact they're difficult to please. Now, you may have sensed that I'm dancing around the point a bit with this introduction, and you'd be right. Truth is, I'm finding this review quite difficult to get through, because I'm struggling to be positive. Why's that such a big issue? Because my complaints about Nightvault pretty much boil down to "I have too much of a good thing," and the absolute last thing I want to do is write a negative review complaining about Games Workshop actually supporting a game for the long haul. I guess, what I'm trying to say is, I have a problem with Nightvault. And that problem is me. 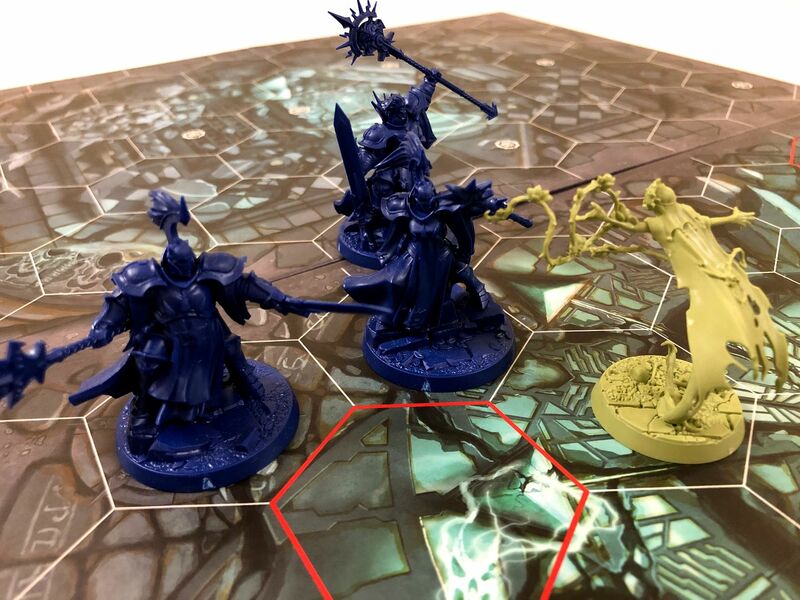 When it came to Warhammer Underworlds: Shadespire (the original core set for the Warhammer Underworlds game system) it was love at first sight. 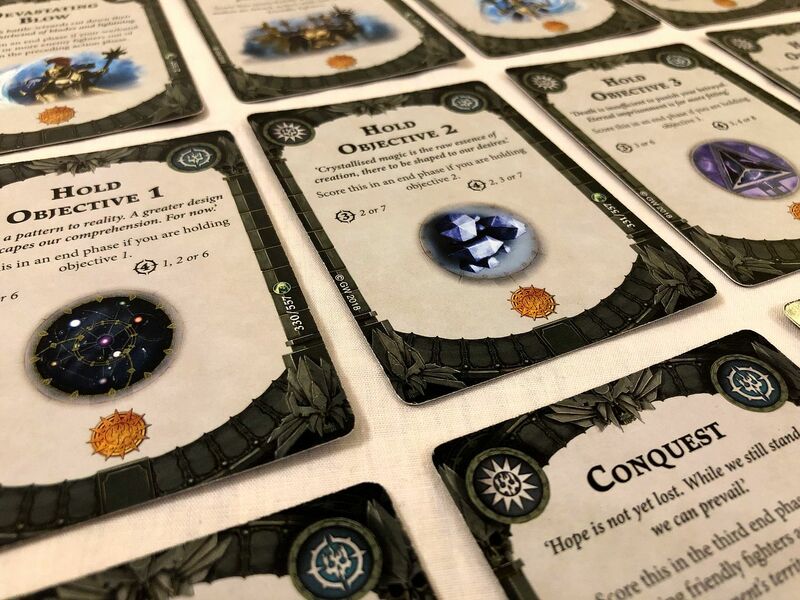 I was instantly hooked by gorgeous miniatures (obviously), beautiful artwork, clever game mechanisms, and fun deckbuilding that opened up the potential for multiple paths to victory. Anyway, everything was amazing. And the icing on the cake was the promise of long term support from Games Workshop. Sure enough, within days there were new warbands on the way. I bought them all. 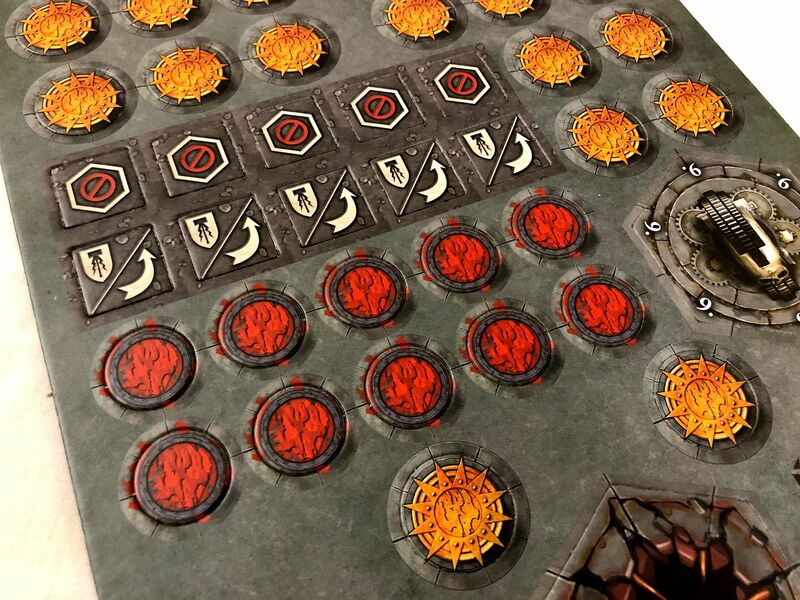 Each warband expansion comprised stunning easy-build miniatures, including some of the finest skaven and skeleton miniatures I've ever seen, and a fistful of cards to open up the deckbuilding options and the scope of in-game tactical play. But, like most things, I did start to feel like the release schedule was a model of diminishing returns. By the time the last two warbands went to retail, I was mainly buying them to complete the set. Then I bought the pack of leader cards because I thought it might mix things up a bit (I still don't think I've used any of those cards). And finally I bought the map pack because I wanted extra boards for multiplayer games. At that stage, I honestly felt like I had enough. I don't play the game at a competitive level, I don't travel to tournaments, and I had so many cards I could comfortably whip up a deck for any occasion, or even create several static decks for my favourite warbands. I was done. There was nothing more the game could offer me. 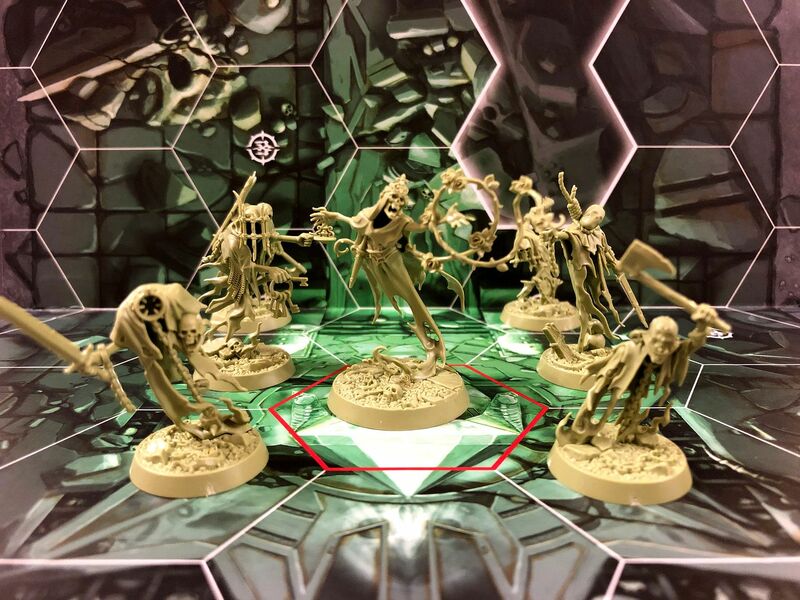 And it turned out there was something the game could offer: Nighthaunts. Having recently bought into the Soul Wars starter set for Age of Sigmar, I was already invested in the concept of the nighthaunts, and Nightvault had some really lovely models to add to my collection. Additionally, this new core set arrived with new game mechanisms. Namely, magic. There were also boards featuring lethal hexes (something that didn't exist in the original core set). However, as I'd already purchased the previous map pack which is where lethal hexes first appeared that wasn't really pushing my buttons. But long story short: I was hooked again, and I dutifully paid the admission price for this brand new core set product. And then I was a bit disappointed. I'll get to that in a moment, but before I do, I wanted to briefly go through exactly what Nightvault is, because sometimes it still causes a bit of confusion. Basically, this is the new core set for the Underworlds product line, replacing Shadespire which is now no longer in production. It's the entry point for new players, and also a flagship release to signal the beginning of a "second wave" of warbands. 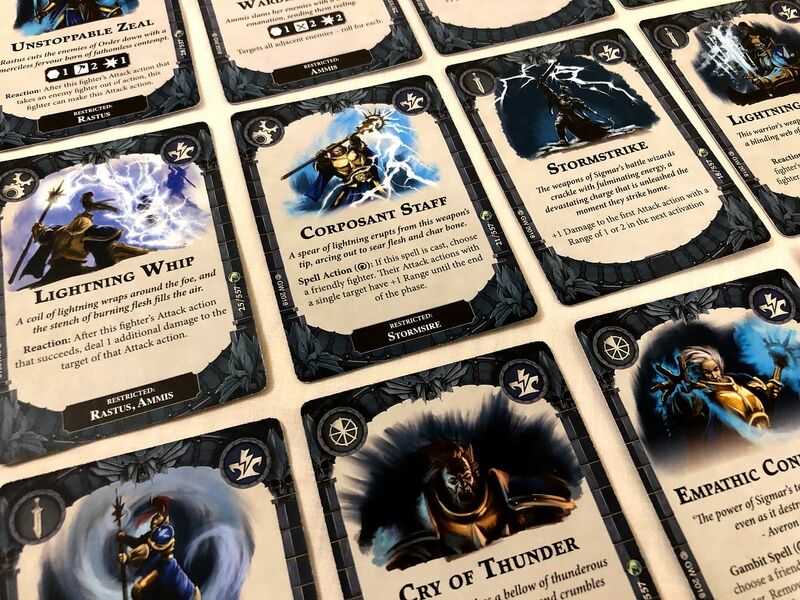 The core set itself contains two warbands (nighthaunts and stormcast battle mages), two double-sided boards, all the tokens and dice you need to play, a tightened up and slightly clearer rules book, and a wedge of cards. 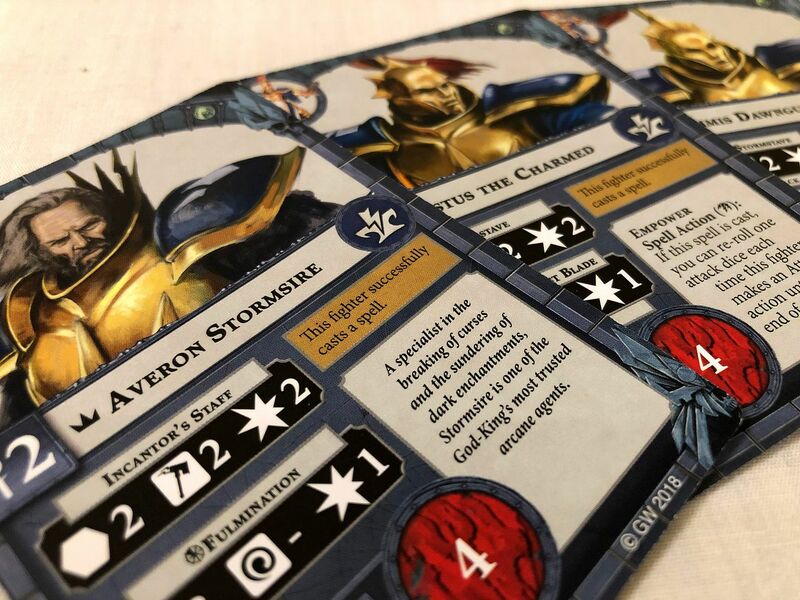 Most of the cards are reprints of cards that came in the Shadespire box, and they're the ones that are often the "backbone" of a deck, such as cards for holding single objectives and very basic but always useful power cards. In total, five cards were dropped from Shadespire: Healing potion, Shardfall, Sprint, Disengage, and Total Offence. Those five cards were replace with: Determined Effort, Grinding Earth, Vital Surge, Escape Artist, and Lucky Trinket. 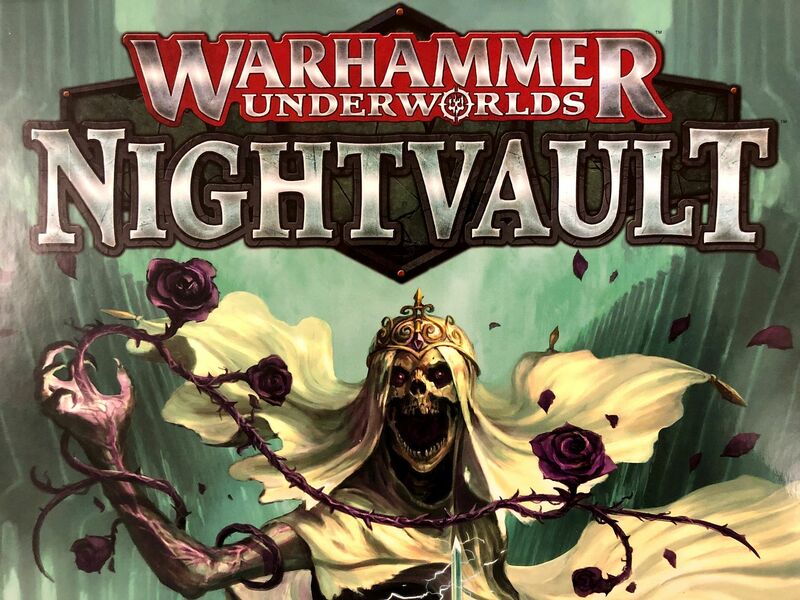 So, effectively, Nightvault replaced Shadespire, and everything in Nightvault is compatible with everything that came before it. However, if you already have Shadespire, it's probably still worthwhile buying Nightvault because you get two new warbands, two new boards, access to the new magic and scatter mechanisms (and the dice and tokens to use them), and an extra set of the really useful cards that make it easier to preassemble working decks before your mates come over to play (plus a few new cards you won't have seen before). 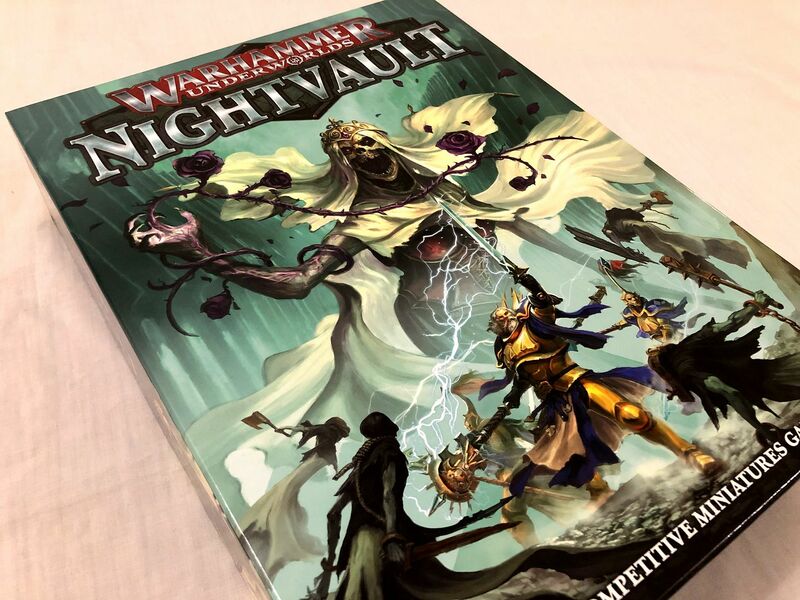 Conversely, if Nightvault is your entry to the game, you might still want to pick up Shadespire, if you can find it, for most of the same reasons. But don't worry if Shadespire is sold out by the time you read this. 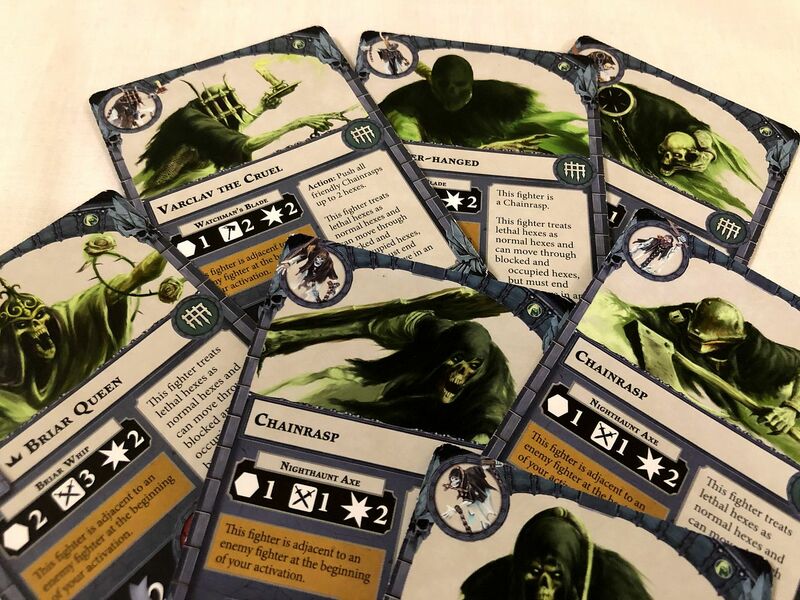 The boards and warbands are available as separate purchases, and the warbands have even had an exciting makeover with new cards that weren't in Shadespire. Oh yeah... So Nightvault is a new beginning; the start of a second leg in the game system. As such, it has all the same great stuff going for it that Shadespire had. That being the case, why have I ended up a bit disappointed? Primarily, I think it's burnout. I already mentioned, I was beginning to feel like I had a complete game by the end of the first wave of products, and seeing a lot of the same cards again, and a lot of new faction-specific cards that felt very similar or even identical to cards from other factions I already owned, somewhat deflated my general enthusiasm. One of the biggest problems is actually a strength of the game: The designers wanted to give you options for different routes to victory. That's great in principle, but in practice it means that many of the warbands end up having similar cards. Most of them have cards that score glory for holding objectives, most of them have cards that score glory for killing the enemy leader, most of them have cards that score glory for having a certain number of models left on the field. Basically, whatever tactic you want to try, there are cards for it. Of course, certain warbands favour certain strategies that play to their strengths, and I'm certainly not suggesting that all warbands play the same, because they really don't; but it's hard for me not to feel like I've seen it all before. Admittedly, there are some interesting looking warbands in this second wave. The grots and the troggoth faction in particular look like they bring some new ideas to the table. But I'm still predicting I would see a lot of cards in those expansions that feel like cards I already own, and as much as I love the look of those warbands, I think it's time to listen to my gut. I'm just not excited anymore. But, I hear you cry (or maybe that's just the voices in my head), there are new game mechanisms. What about the magic? Yeah, well this is the bit where I just prove that I'm hard to please and really emphasise that the problem is with me and not the game. After complaining about the things that feel the same, I'm now going to complain about the biggest change. I really don't like the introduction of magic. In theory, there's nothing wrong with the idea; in practice, it's over-egged the pudding. But it's not mechanism itself that's the problem. Simply put, there are now magic spells that only a magic user has access to. 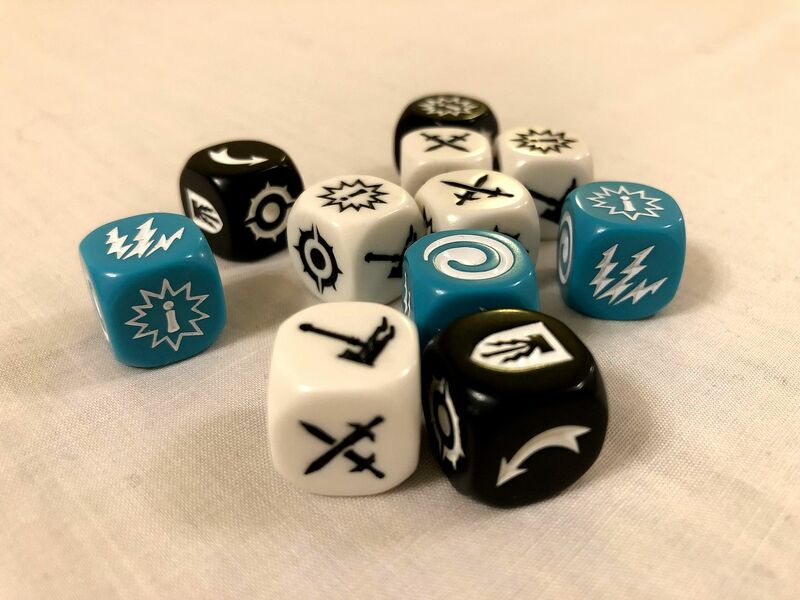 You roll a number of special magic dice equal to the power level of the magic user, and apply the affects of the spell if you match the necessary symbols. These new powers tend to be stronger than basic ploys, but they come with a risk that they might not work, and your magic user may even take a wound in the process if you roll multiple critical successes. The problem is the knock-on effect magic has for power cards and deck construction. Ploy cards are now a subset of a new type of card called gambits, with spells being the other subset. So, a gambit can be a spell or a ploy, but a ploy is only a ploy, and a spell is only a spell. Furthermore, attacks are now divided into attack actions and spell attack actions. This immediately causes some confusion, creating extra opportunities for mistakes and misunderstandings. For example, your opponent may cast a spell, and you look at your hand and think you have the perfect counter; but once you play your counter you realise it only works against ploys and not against spells. This is particularly a problem when you're using cards from the first wave of releases which all refer to "ploys" and therefore don't interact at all with the new spell cards. Worse than that, the introduction of magic also introduces something far less exciting: Redundancy. Prior to the release of Nightvault it was very rare to have a card in your deck that was worthless. There were a few objective cards that said things like "kill at least five enemies", which were no good if you ended up facing a small warband such as the stormcast eternals; but it was easy to build that kind of redundancy into your objective selections. The problem now is magic means it's possible to have power cards in your hand that simply have no purpose if you face a particular enemy. What good is an upgrade that gives you a bonus when fighting wizards when you're facing a warband that doesn't have any wizards? What good is an amulet that allows you to resist a spell when you're opponent won't cast any spells? 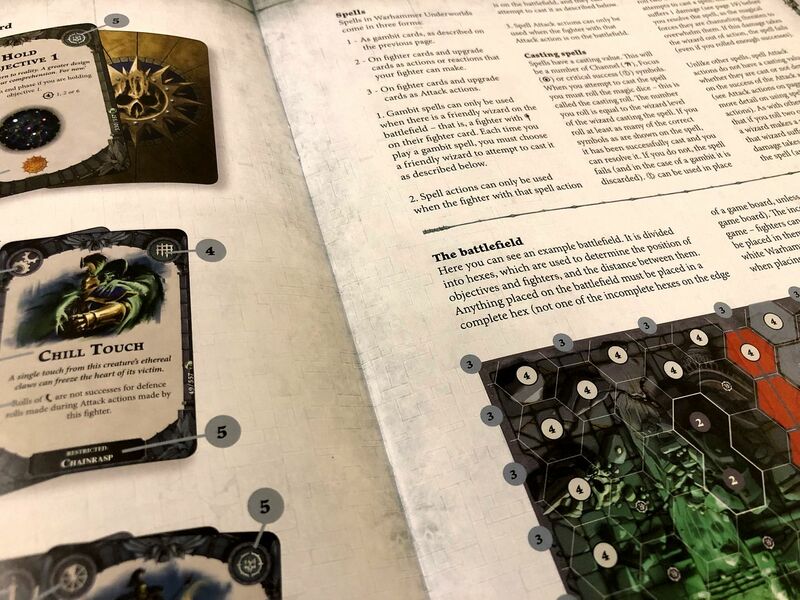 In Warhammer Underworlds you don't know which warband you're gong to face in advance, and now there are so many situational cards it's much more difficult to tailor a deck to be effective. Decks revolving around wizard hunting abilities are going to be all-or-nothing deals, where you don't even bother to put your eggs in a basket you just juggle them while running. It's not like there are even rules for a sideboard that allows you to swap out a selection of cards depending on which opponent you face. One or two cards that aren't effective in a particular skirmish may not seem that damning, but this is a game with a very tight design. Keep in mind, you only get 12 actions in the whole game, and often you'll only have a deck of 20 power cards to play with. The game is so small and compact it makes every decision huge, and finding out that even one of your cards is taking up dead space in your deck has serious repercussions. Oh, and I don't like lethal hexes either. They're spaces on the board that cause one unblockable damage when you enter them. But at least one side of each of the double-sided boards is free of lethal hexes, so I can't really complain all that much about them, can I? And that's really what I'm doing here. Complaining. Probably a bit unfairly. I really shouldn't complain about the game giving players enough options to choose how they want to build their strategy. I shouldn't complain about the designers introducing a robust new magic system to add a new twist to standard play. I shouldn't complain that Games Workshop is showing an honest commitment to supporting this game and keeping things fresh, rather than putting out weak releases or forgetting about the game completely. I shouldn't. And I feel bad for doing it. This whole review has made me feel bad. So, on reflection, this second delve into the Warhammer Underworlds in search of shadeglass is the end of the line for me. I'm destined to walk the mazes of the Mirrored City countless more times - perhaps forever - but I'll be in the company of old friends and ghosts from the past. I don't need any more new warbands, I don't need any more cards that do very similar things to cards I already own, and I don't need more new rules and keywords to clutter up my games. But (and this is incredibly important) that doesn't mean I think Nightvault is bad. It's not bad. It's exceptionally good. My complaints are personal, and say more about me and my tolerance for expanding a single game line than they do about the quality of the game itself. I may feel like magic and lethal hexes have diminished my personal experience, but that doesn't mean they're poor changes. And while I may be growing tired of seeing very similar objectives and power cards, that doesn't mean those are bad cards. Indeed, for anybody using Nightvault as their entry point to the system, these differences and similarities won't mean anything at all. Besides, if you don't like the magic, you can always buy some of the older warbands and just play without wizards. Because most importantly, at the heart of it, Nightvault is still the same game. It offers the same (different) deckbuilding possibilities, the same (different) great miniatures, and the same (different) tactical play. This is an amazing game, and I do think people should give it a try; but my enthusiasm for collecting a second wave of warbands has disappeared like breath on a mirror. I think that, much like the doomed warriors traversing this dark domain, while the game still has some life in it, too long in the Mirrored City has left it diminished. Or then again, maybe I just need to accept that I'm awkward. Maybe I just need to take a good long look at myself and realise that I'm simply very hard to please. And actually quite annoying. And probably a bit of a pillock. Warhammer Underworlds: Nightvault and Underworlds expansions are available from good game stores and online. You may even be able to find a copy of Shadespire knocking about.